The waning days of young summer friendship are charted with incisive depth and wiseass humor in Stand By Me, Rob Reiner’s superlative dramatization of Stephen King’s novella “The Body.” As in its source material, Reiner’s story concerns four best friends who, on Labor Day weekend 1959, learn the whereabouts of the corpse of a missing schoolmate, and set out on foot through the forests and countryside that surround their Castle Rock, Oregon hometown to find it. Their story is one told in flashback by Gordie (Richard Dreyfuss as an adult, Wil Wheaton as a kid), who narrates his memories of this fateful trip alongside his three pals: Chris (River Phoenix), who’s seen by locales as a troublemaker thanks to his ne’er-do-well brother; Teddy (Corey Feldman), whose “loony” WWII vet father cruelly burned his ear and saddled him with a nutjob reputation; and Vern (Jerry O’Connell), the pudgy sidekick who suffers the brunt of Teddy, Chris, and Gordie’s profane jabs and insults. Theirs is a ribald, authentic rapport, full of name-calling, manhood challenges, and other assorted teasing and ridicule that rings true to the many ways boys bond through verbal abuse. In its campfire tales of puking, and its races to avoid being run over by speeding trains, the film proves to be a touching depiction of adolescent camaraderie. All four of them damaged by familial traumas—most clearly Gordie, whose parents have emotionally shut him out after the death of his favored older brother (John Cusack)—the four kids set out on their odyssey driven by a shared morbid curiosity. Yet Bruce A. Evans and Raynold Gideon’s script subtly suggests that what really motivates them all is an interest in confronting, first-hand, their own mortality. To that end, Stand By Me, rife with panoramas of its protagonists dwarfed by their natural surroundings and imperiled by towering older bullies (led by Kiefer Sutherland), also becomes a melancholy portrait of youthful vulnerability, and the way in which friendship is often the strongest shield against life’s many hazards. 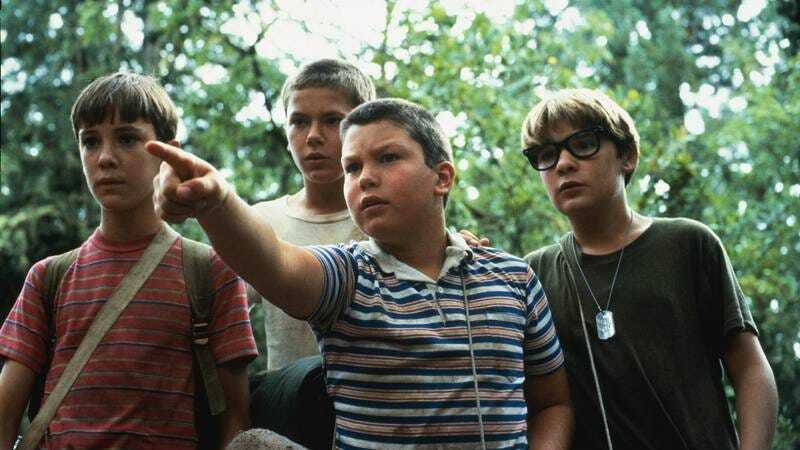 Availability: Stand By Me is available on Blu-ray and DVD through Netflix, Amazon, or possibly your local video store/library. It’s also currently streaming on Netflix, and can be rented or purchased through the major digital services.